On the Official Gmail Blog, software engineer Zohair Hyder has announced that Google is introducing improved Google+ notifications in Gmail. Users will now be able to reply to Google+ notifications directly from their Gmail accounts and +1 posts, further intertwining the two services ever so slightly more. 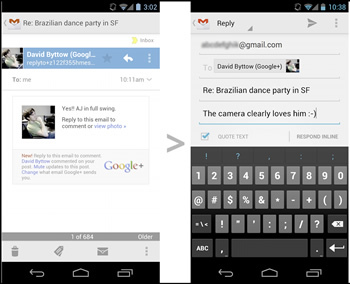 Additionally, the social-minded improvements extend to the mobile version of Gmail as well. As with most Google service updates, rollouts are performed on an account basis so not everyone will see the feature just yet. The rollout is expected to be completed in about a week. Love it or hate it, the big G seems intent on making its own social networking service a success by leveraging other popular Google products and services. Last year, the search giant gave Google+ a nudge with "Search, Plus Your World", enabling the feature by default. They've also integrated features from Docs and YouTube into Google+ Hangouts and it's because of Google+ that Picasa users can enjoy unlimited photo storage, albeit "unlimited" is subject to some ultra fine print. Google has been gradually but steadily improving the social service since its introduction last year. In recent months, the company launched a fresh look which aimed to both simplify and beautify Google+ and introduced Hangouts On Air, a way to broadcast your own live video for public consumption. In February, Google+ had surpassed 100 million users. Users can adjust their Google+ notification settings by visiting their Google Account Overview page.